Atomo was an Italian car manufacturer started by the Parma baised Samca and developed from 1947 to 1948. They built cars after a three-wheeler principle. 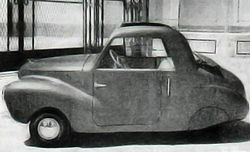 The drive of the car was designed to operate the two front-wheels individually, while the rear wheel was for steering. A small pilot project run was produced but not accepted by the market. Car options like the Fiat Topolino and other small car manufacturers had already occupied this space successfully been available in the market. The Atomo disappeared from the market after only one year.